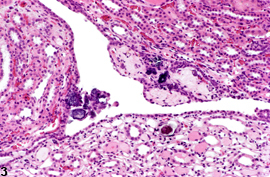 Kidney - Calculus in a female F344/N rat from a chronic study. 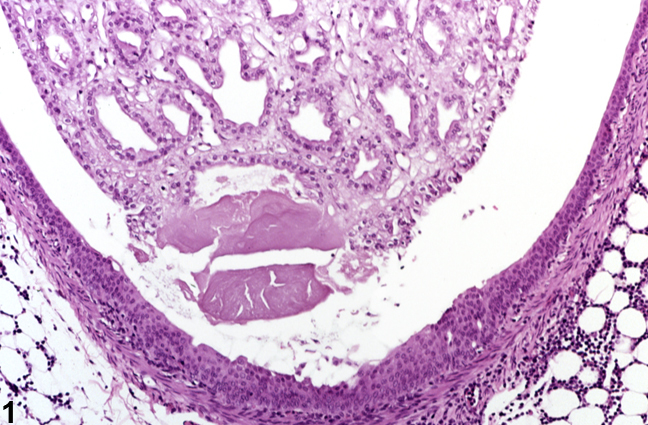 A small calculus is present near the tip of the renal papilla. 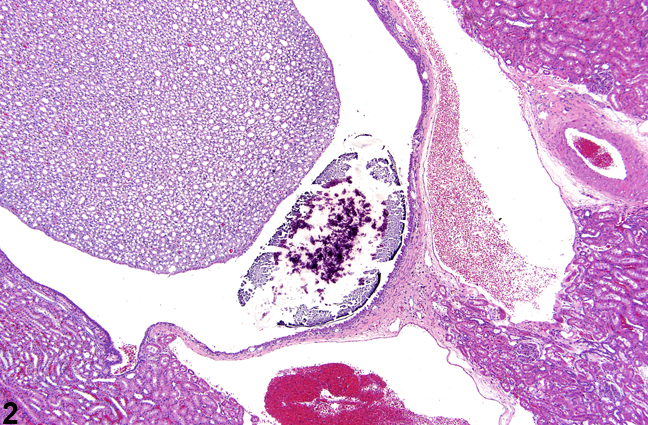 Kidney - Calculus in a rat. A calculus is present within the renal pelvis. 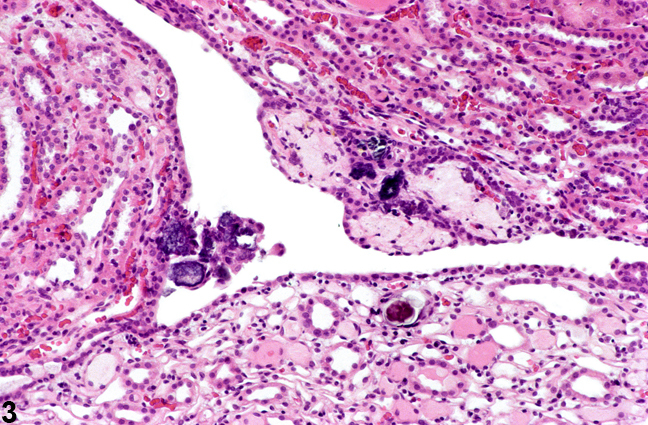 Kidney - Calculus in a male F344/N rat. Small calculi are present in the renal fornix. Spontaneous cases of calculi are sporadically seen in the renal pelvis of rodents. Calculi may also be associated with xenobiotic administration and may even contain the administered chemical or compound. Calculi tend to be basophilic concretions of variable size, which may result in inflammation, obstruction, or urothelial hyperplasia ( Figure 1 and Figure 2 ). Calculi can be differentiated from mineralization in that calculi are generally free within the urinary space whereas mineralization occurs in tissue. Small calculi are often observed in the renal fornices, where they often do not result in any secondary changes ( Figure 3 ). Calculi should be diagnosed and given a severity grade. 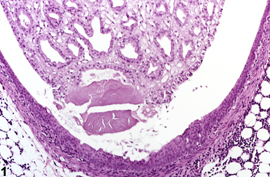 The pathologist shoulduse his or her judgment in deciding if small calculi in the renal pelvis or pelvic fornices without other secondary changes are prominent enough to warrant a diagnosis, or if changes secondary to the calculi, such as inflammation or epithelial hyperplasia, are prominent enough to warrant a separate diagnosis. Montgomery CA, Seely JC. 1990. Kidney. In: Pathology of the Fischer Rat: Reference and Atlas (Boorman GA, Eustis SL, Elwell MR, Montgomery CA, MacKenzie WF, eds). Academic Press, San Diego, 127-153.